Explain “Xi Jinping Thought” and its place in the evolution of modern Chinese political ideology. There is hardly anything new in “Xi Jinping Thought on Socialism with Chinese Characteristics for a New Era.” Judging from the speeches and writings published under Xi’s name, “Xi Jinping Thought” is nothing but a mixture of dissimilar ingredients taken from his predecessors, bristled with the old fancy slogans of the past, including the slogans of the Maoist China and the reforming China. What is the correlation between political ideology and ideological power, and how does Xi legitimate both? What is the impact of the incorporation of Xi Jinping Thought in the Chinese Communist Party (CCP) constitution on Chinese domestic politics? There are only two CCP leaders having a “thought” bearing their names written into the constitution of the Party when they are alive: Mao and Xi. Learning a bitter lesson from the Cultural Revolution, liberal leaders Hu Yaobang and Zhao Ziyang opposed personality cults and did not put their “thought” or “theory” into the Party constitution when they served as the Party boss. “Deng Xiaoping Theory” was written into the Party constitution after he died. Jiang Zemin’s “Theory of Three Represents” and Hu Jintao’s “Concept of Scientific Development” were added into Party constitution without their names. Xi has now put on par with, or ranked even higher than Deng. This is a clear indication of Xi’s ambition to reverse the post-totalitarian regime back to the totalitarian regime. Is China’s economic model of “socialism with Chinese characteristics in a new era” a viable alternative to Western free-market liberalism? Explain. “Socialism with Chinese characteristics” is a party-state capitalism in which the communist party-state dominates markets primarily for its political gain, acting as the dominant economic player, controlling the upper stream industries and using markets primarily for maximization of the state power without legal limits. Over the last four decades, China has achieved economic growth similar to developed economies at the stage of industrialization and urbanization, with assistance by unprecedented grand transfer of capital and technologies enabled by globalization. Rapid development in China has resulted from a combination of communist brutality and neoliberal brutality, leading to systematic violation of human rights, resource exhaustion, environmental degeneration, structural corruption, and kleptocracy. It is neither sustainable nor morally desirable. It has condemned China to the “middle income trap” and the “curse to the late-comer,” as basic institutions for a healthy economic development, including basic human rights and the rule law, have not been established. As Beijing further consolidates and projects power at home and abroad, what strategic messaging should be coming from Washington, Canberra, and other regional stakeholders? Countries of the “West” have both strategic and moral choices to meet the “China challenge.” Short-term commercial benefits should not be pursued at the expense of justice. A clear distinction should be drawn between China and the Chinese communist regime. China should be welcome and encouraged to embrace both the economic and political civilization of humankind, acting as a responsible stakeholder in the existing law-based international order. 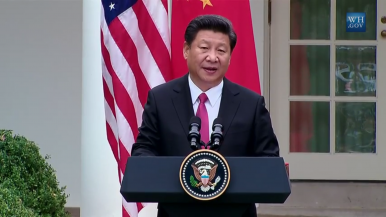 The Chinese communist regime should not be appeased to become a headquarter of world authoritarianism, blocking China’s transformation toward constitutional democracy and undermining democratic values and institutions worldwide. Why Xi Jinping Thought Is a Threat to China's FutureChina Sells Socialism to the Developing WorldChina's Millennials: Consumer SuperpowerNew Hopes, Old Fears: China’s 19th Party CongressChina and Russia Pose Different Problems for the US. They Need Different Solutions.